It was Felix Rosenqvist‘s turn at St. Petersburg to start the 2019 NTT IndyCar Series season. This week, it was Colton Herta‘s time to shine at Circuit of the Americas (COTA) except on this day, the fresh face finished off the effort in Victory Lane. The teenaged rookie continued to show his preseason speed was no fluke, Herta claiming his first IndyCar win in just his second career start. Runner-up in last year’s Indy Lights Championship, Herta never fell out of the top five Sunday (Mar. 24). He stuck right with Indianapolis 500 champions Will Power and Alexander Rossi most of the day before becoming the main beneficiary of a late-race caution. At 18 years, 359 days, Herta is the youngest ever winner in NTT IndyCar Series history. 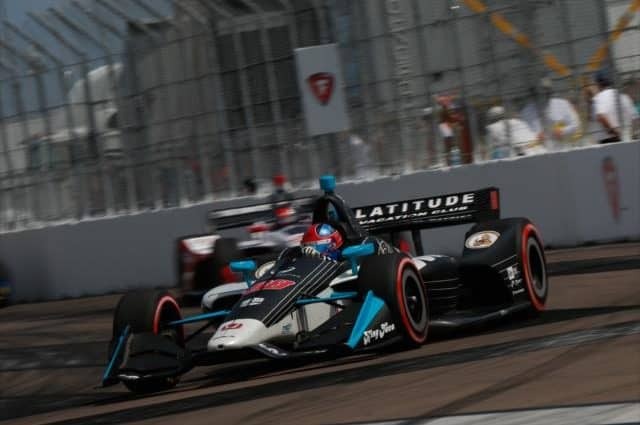 He showed experience well beyond his years, holding off 2017 IndyCar champion Josef Newgarden in a 10-lap run to the finish to give the young Harding Steinbrenner Racing team its first victory. But a record-setting win didn’t always seem like it was in the cards. Power, with a shot at the $100,000 bonus if he could turn his pole position into a victory, led the charge up the hill to a tight Turn 1. He then held off a looming Rossi and Herta much of the day, leading a race-high 44 laps. Behind him, tire degradation, a much-discussed topic all weekend, played a big role early. It mixed up the field in the first round of pit stops and provided opportunities to move up. Herta, who stopped for new Firestone Firehawks a few laps earlier, beat Rossi, charging out of pit lane on cold tires, to Turn 1. That jumped him up to second place. But he wasn’t the only driver to benefit from early pit strategy. Newgarden ducked into pit lane a few laps before the leaders and leapfrogged up to fourth from his seventh starting spot. The Arrow Schmidt Peterson Motorsports pair of James Hinchcliffe and Marcus Ericsson also jumped into the top 10 with smart strategy. Both of them pitted for new Firestones before lap 10. Patricio O’Ward, in his first of 13 races with Carlin Racing, also got off to an impressive start. The rookie jumped up to sixth in the opening lap, hanging right with defending champion Scott Dixon. After the first round of pit stops, the young Mexican rookie put the moves on Graham Rahal, pulling alongside the veteran in the run down to Turn 12 on lap 15. O’Ward finally completed the pass in Turn 19. You thought @PatricioOWard would take it easy in his 2019 debut? Nope. But Herta wasn’t able to stay in front of Rossi for long. Last year’s runner-up took back second place on lap 22 in the run down the long back straightaway. Rossi, along with Power, then pulled a gap back to Herta. That appeared to set up the last 30 laps to be a battle between those two. But a late yellow flag changed the entire complexion of the race. Rosenqvist smacked the inside wall between Turns 19 and 20 after being turned by Hinchcliffe. The incident caught out Power and Rossi, who had yet to stop for fuel and fresh Firestones. The pair hit pit road, along with Dixon, giving Herta the lead. Rossi had a clean stop, rejoining the field back in 15th. But Power, after leading the entire race to that point, wasn’t able to get the car in gear. That ended his day – and a shot at the $100,000 bonus – early. Going back to green with 10 laps left, Herta left Newgarden and Ryan Hunter-Reay in the dust, pulling out to a big lead that he never relinquished. Herta’s win took the record of youngest winner from Rahal, who was 19 years, three months old when he won the 2008 Firestone Grand Prix of St. Petersburg. The victory was also an impressive performance for the HSR team. Herta’s Honda engine expired during Friday’s first practice session, leaving his crew with the tall task of replacing a power unit before Saturday’s qualifying session. They lost an engine in practice, then @FollowHSRacing came back to push their rookie to victory lane. Behind him, Newgarden followed up his season-opening victory with another podium finish. That kept him in control of the point standings two races in. Hunter-Reay capped off the podium, bouncing back nicely from his 23rd-place finish in St. Petersburg. Graham Rahal, who completed 11 on-track passes over the course of the race, came home fourth. Sebastian Bourdais, who also had a disappointing start to the year, rounded out the top-five finishers. Marco Andretti and Takuma Sato proved to benefit from the late-race yellow-flag period. The pair came home sixth and seventh, giving each their first top 10 of the year. O’Ward backed up his impressive on-track moves with an eighth-place result. In his two career NTT IndyCar Series starts, the young Mexican driver has two top-10 finishes. While a podium finish once looked inevitable, Rossi was able to recover for a top-10 result. He was ninth, salvaging a day that could have ended in complete disaster. Jack Harvey followed up his 10th-place performance in St. Petersburg with another at COTA. Further back, it was also another disappointing result for Frenchman Simon Pagenaud. After starting back in 22nd, the Team Penske driver worked his way up through the field. At one point, he charged to just outside the top 10, but ultimately ended the race in 19th. He now sits a disappointing 14th in the season standings. This is a good series to watch close racing. It should be with all the spec cars. Anyone could win the race on any given Sunday.